In 1726, the Vestry of Croydon resolved to erect the town's first workhouse at a site on Dubber's (now Duppas) Hill. The establishment was open by the end of the following year and governed by a committee of Trustees. In October 1727, the Vestry decided to "inquire into all such poor people of this Parish, who are Pensioners, and Orphans, and who receive the Collection-Money. And know if they are willing to enter the Workhouse. If not, they will be struck out of the List, and no more Allowance Money paid them after this Month." The following month, the Vestry agreed that "the Spinning of Mop-Yarn be the proper Work of the Poor of this House." Inmates of the parish workhouse worked from 6am to 7pm in summer, and 7am to 6pm in winter. They had to "sit at Meals in a decent Manner with Hands and Faces washed, Hair combed and Clothes brushed". There was to be "no Tobacco to be smoked in their Lodging-Room" or any "Distilled Liquors" to come into the House" — the latter probably aimed at the new habit of gin-drinking which was sweeping the England around this time. The drinking of beer, on the other hand, was considered healthy and a brew-house was set up in the workhouse in 1730. At the time of its opening, the Trustees ordered clothes for the children from a Mr Glover and a Mr Hodsden, the boys' suits costing ten shillings apiece, and the girls' eight shillings. Two years later, however, the children were required to make their own clothes from material they had spun themselves. On entry into the workhouse, inmates had any remaining possessions taken away. From 1739, they also had to wear a paupers' badge on their shoulder. The same year, one William Tidy was appointed porter and gatekeeper to control the movements of the inmates in or out of the workhouse. From 1750, inmates were not allowed any visitors whatsoever, and the workhouse was becoming a virtual prison. However, church-going was often an opportunity for an excursion outside. In February 1753, following a complaint that "several of the Poor, let out of the House to hear Divine Service on Sabbath Days were frequently seen about Town, begging, and often drunk, it was ordered that, for the future, no Person thus scandalously behaving, should be suffered to go out of the House, on any pretext whatsoever." A parliamentary report of 1777 recorded that the Croydon parish workhouse could accommodate up to 80 inmates. Mitcham had a workhouse from around 1742 overlooking Figge's (or Pigg's) Marsh. In 1777, it housed up to sixty inmates. In 1782, at a cost of £1200, it was replaced by a new building on the north side of Mitcham Common. The building later became a factory producing waterproof clothing for troops in the Crimean War. County of Surrey: Croydon (7), Addington, Beddington with Wallington (2), Coulsdon, Merton (2), Mitcham (3), Morden, Sanderstead, Woodmansterne, Penge Ville in Battersea Parish. Later additions: Wallington (from 1866). The population falling within the Union in 1831 had been 22,113 — ranging from Woodmansterne (184) to Croydon itself (12,447). The average expenditure on poor relief for 1833-5 had been £12,502 or 11s.4d. per head of the population. 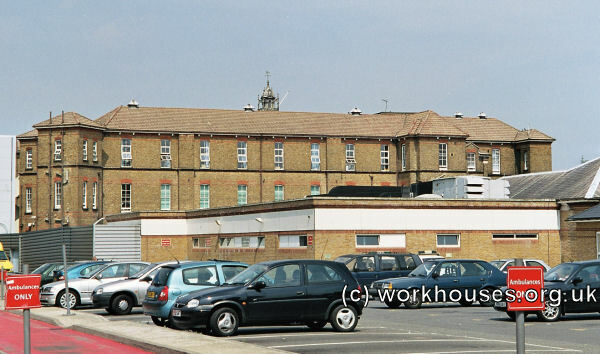 The new Croydon Union took over the existing workhouse at Duppas Hill, and also one at Mitcham. However in midsummer 1838, the cost of running two workhouses led the Board of Guardians to close it down and transfer the inmates to Croydon. In 1838-40, the sum of £3,503 was expended in enlarging the Croydon workhouse and by 1842 it could accommodate up to 350 inmates. Fire insurance particulars record that the main building at this time comprised: board room, hall, kitchen, cookhouse, bakehouse, bread store, two Cellars, Master's room, old and infirm men's ward, servants' room, two bedrooms for the Master, men's large sleeping ward, 2 wards for boys, two men's sleeping attics, three wards for able-bodied women, nursery and three wards for aged women. In other buildings were: men's day room, a boys' schoolroom, an infirmary, and tailor's and shoemaker's workshops. Croydon workhouse from the south, 1866. Croydon main block from the east, 2002. Croydon main block from the north-east, 2002. Croydon western accommodation block from the south-east, 2002. Croydon workshops from the east, 2002. 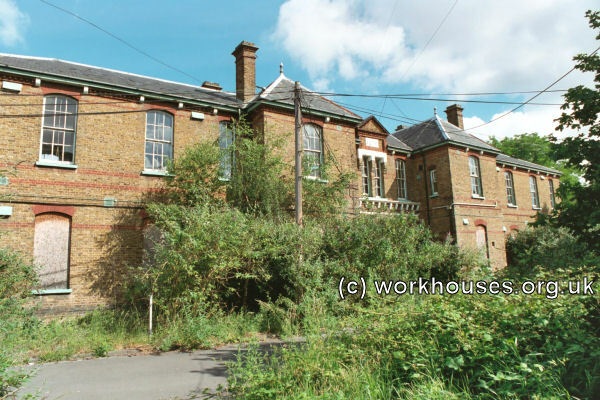 After the new building was opened, the old workhouse at Duppas Hill was used as an infirmary until 1885 when a new infirmary was at Mayday Road. An isolation wing was opened in 1879 to the east of the workhouse. 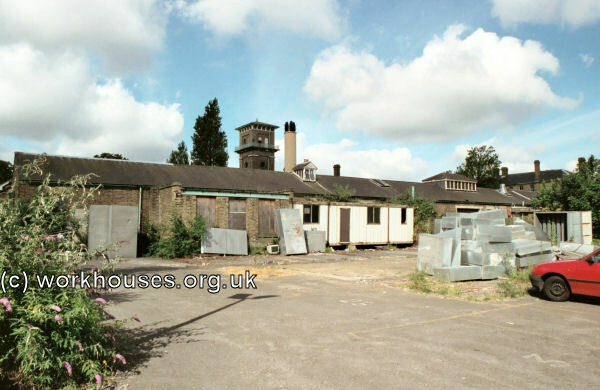 Croydon isolation wing from the south, 2002. 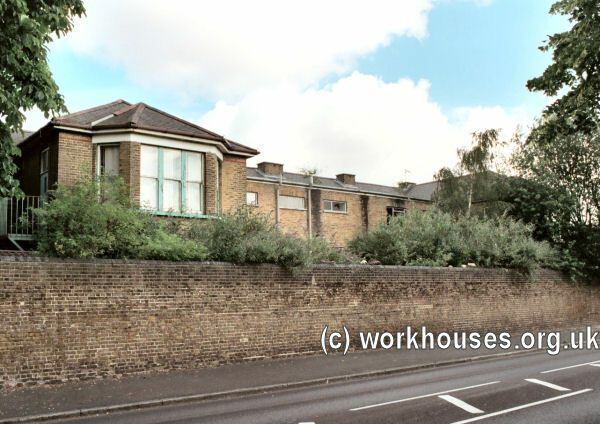 The workhouse was taken over by Croydon Borough Council in 1930 and became Queen's Road Homes. In many ways, little else changed for the inmates who, according to new rules issued in 1930, were prohibited from possessing alcohol, knives, razors, heavy belts, dice, or playing cards. Everyone was searched on admission, and any money or valuables were taken away for safe keeping. Inmates had to rise at 7am, then work from 8am until 5pm. Bedtime was 8pm in winter and 9pm in summer. Miscreants would be placed in solitary confinement for up to 12 hours. During the Second World War, the Homes were provided medical facilities as part of the Emergency Medical Scheme. The main part of the building was badly damaged by bombing in April 1941. In 1948, as part of the new National Health Service, the institution became the Queen's Hospital specialising in geriatric care. It finally closed in 1987. In 2008, most of the buildings were illegally demolished during a redevelopment of the site. All that survives of the original structure is the central tower of the main block, now incorporated into a modern residential building. In 1876, the union acquired a site for new infirmary a little way to the west of the workhouse at the north side of Mayday Road. In 1881, plans were prepared by the union's architects Berney and Monday for an establishment to hold 423 patients, although with the capability of being expanded to cater for 643. The foundation stone was laid on 26th October 1881, and the official opening took place four years later on 16th May 1885, when the guest of honour was the Archbishop of Canterbury, EW Benson (father of the author EF Benson). The infirmary location and layout are shown on the 1913 map below. 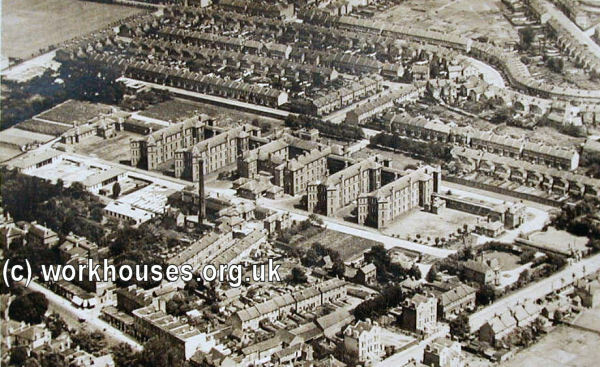 Croydon Infirmary aerial view from the south-west, date unknown. The building was a pavilion-plan design with a central administration block facing to the north-east. Like the nearby workhouse, it had a square tower above its entrance. 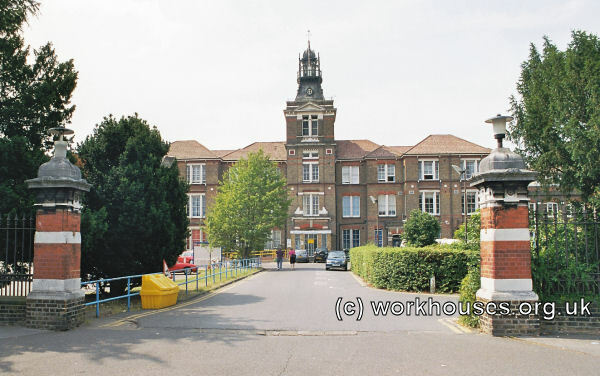 Croydon Infirmary entrance from the north-east, 2004. 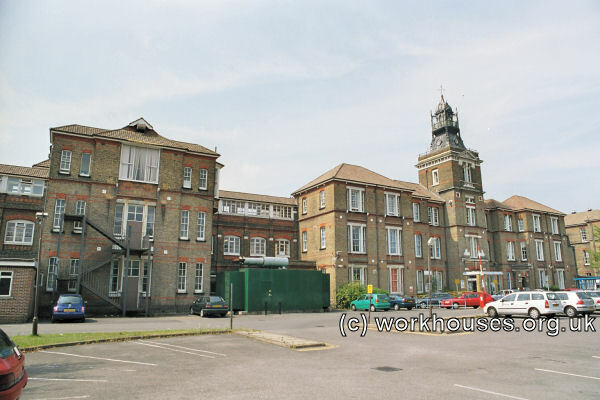 Croydon Infirmary administration block from the east, 2004. To each side were two ward pavilions, each three storeys and containing 104 beds. At the far end of each ward, the sanitary facilities were placed in towers set at an angle. At the near end, the main corridor linked the pavilions and the administration block. 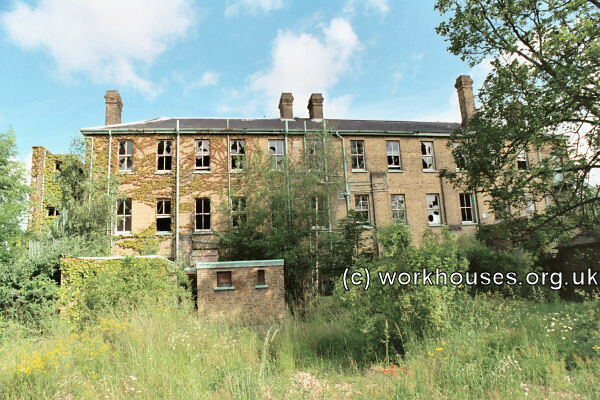 Croydon Infirmary ward block from the south, 2004. 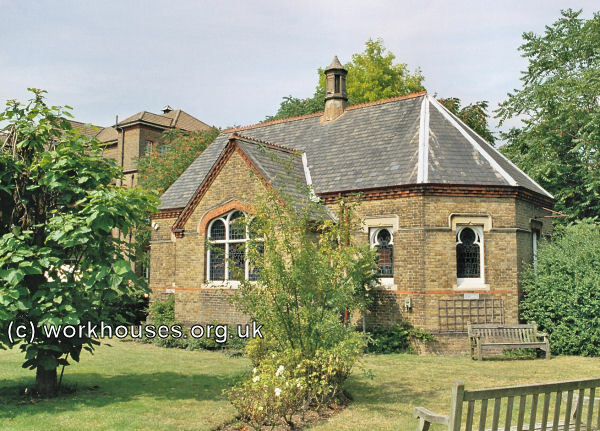 A chapel, dedicated to St Barnabas, was erected in 1895 at a cost of £800. It was located at the north-east of the administration block and originally linked to it via covered way. Croydon Infirmary chapel from the east, 2004. A mortuary was located towards the south of the site. 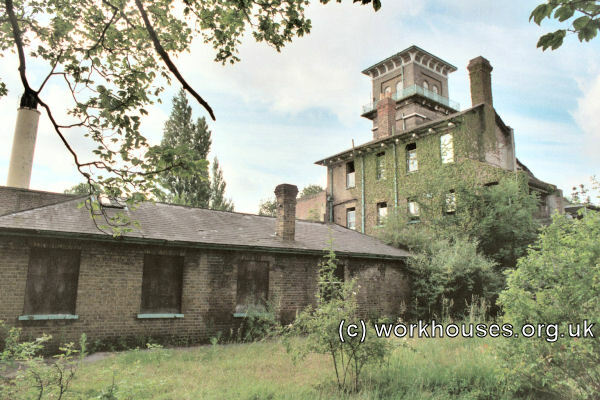 Croydon Infirmary mortuary from the south, 2004. At the south-east corner of the site, the union erected new offices for the Board of Guardians. 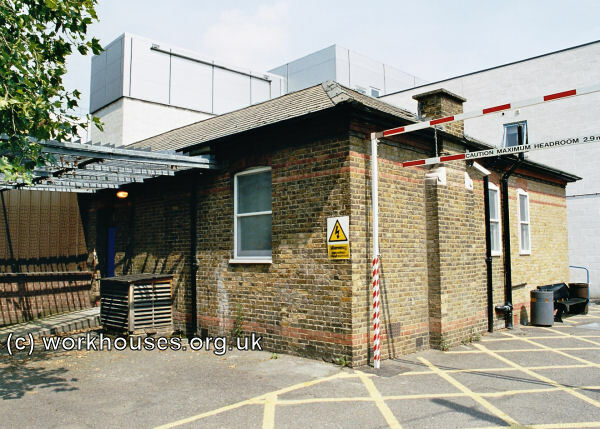 Croydon Infirmary entrance from the south, 2004. Later additions included a children's block and X-ray department in 1924, and a new operating theatre in 1927. In 1930, administration of the hospital passed to Croydon Borough Council. The hospital joined the National Health Service in 1948, and now operates as the Mayday Hospital. Many of the original infirmary structures survive. 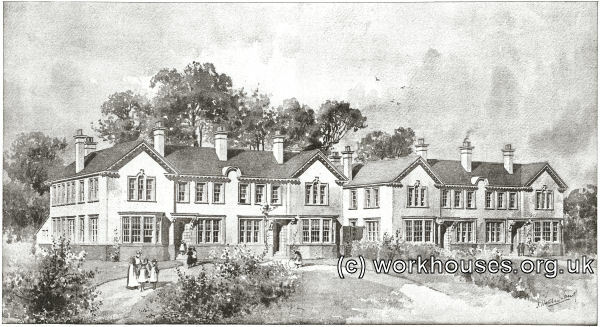 In 1897, the Croydon Union built three pairs of cottage homes (now demolished) on Mayday Road, near the new infirmary. They could accommodate a total of 66 boys. Croydon Union Mayday Road cottage homes from the north-east, c.1903. A cottage home for 20 girls was established at 'Nonington Hall' on Bingham Road, Addsicombe. 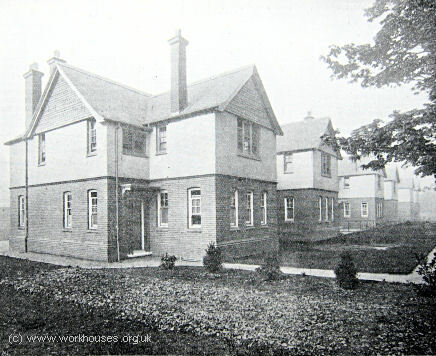 In 1905, two pairs of cottage homes housing a total of 100 boys were built adjacent to the workhouse on Pawson's Road. Croydon Union Pawson Road cottage homes architect's design, 1905. 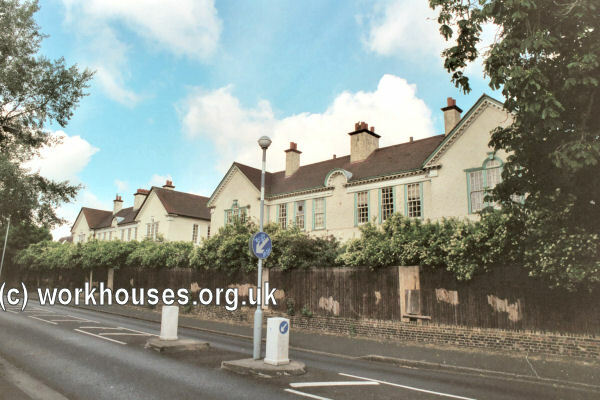 Croydon Union Pawson Road children's homes from the east, 2002. A further block for babies was added to the north of the cottage homes. Croydon Union Babies' Block from the south, 2002. Two cottage homes for girls were later erected at 218-220 London Road, West Croydon. Each home could accommodate 30 girls. In around 1929, four-year-old Len Saunders arrived at the Croydon workhouse to begin nine years of hard work in the laundry, beatings, and abuse. Over sixty years later, many of his memories are still too painful to recount. His recollections of life at the workhouse and the cottage homes can be heard in a series of recorded audio clips. 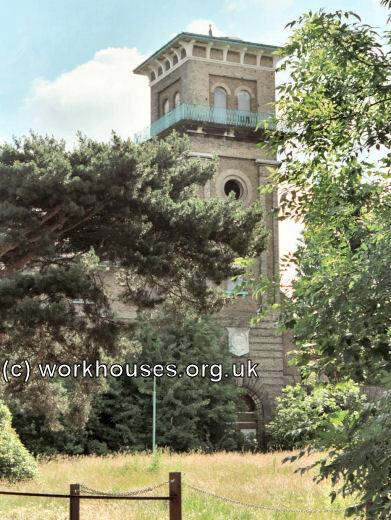 Croydon Parish holdings include: Vestry minutes (1741-1899); Select Vestry minutes (1819-37); Select Vestry Order Books (1819-31); Register of Apprentices (1802-43); Workhouse expenses, and payments to weekly pensioners (1781-82) etc. Croydon Union Board of Guardians: Minutes (1842-47, 1863-1930). 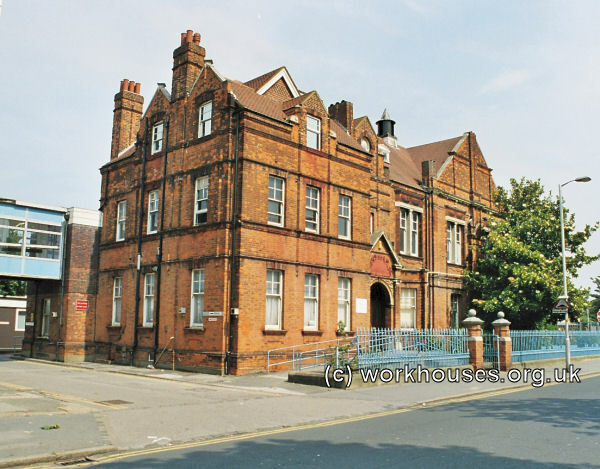 Queen's Road Workhouse: Admissions and discharges (1879-82, 1886-91, 1903-31); Creed Registers (1881-1930); Roman Catholic Creed Registers (1893-1901); Indoor relief list (25 Sept 1900 - 25 Mar 1901). Croydon Online web page on poor relief in Croydon.